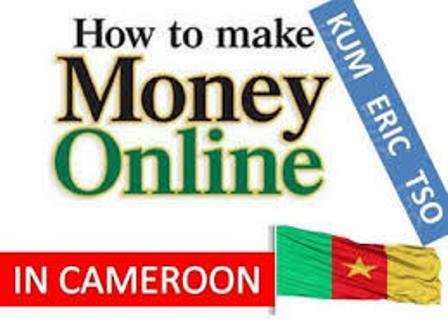 In continuation with our series: Make Money Online in Cameroon, we’ll take a look at 10 Online jobs in Cameroon. Many companies have focused on hiring experts who can work with schedules and meet deadlines but not necessarily be present in the office. There’s been a proliferation in the virtual work-space this century. Deals are sealed via teleconferences, employers recruit via social media and there’s an increasing demand for convenience at work. Countries like Cameroon have embraced this concept and implemented it to be part of their organizations’ culture. In this article, we will talk about the top 10 work from home online jobs in Cameroon. 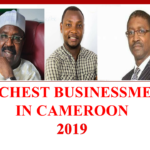 If you are either currently unemployed or not satisfied with what you’re doing, consider these online business opportunities in Cameroon to help you enjoy a better life in the comfort of your home. In case, you need any further training in order to guarantee success online, you can contact the Money Master Tutorials team. This is the most common Online Job in Cameroon. Submission of written articles does not require being physically situated in a company’s office. 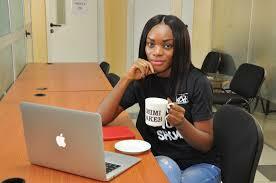 Thus, being a freelance writer is one of the most common work from home jobs in Cameroon. Qualifications are basic. A freelance writer should have a good portfolio of written works; His/her writing must be compelling enough to hold many readers’ attention. As well, writers must be dynamic to be able to provide explanations in a user-friendly manner rather than in a technical fashion. Of course, as content will be posted on the web, applicants must have a good understanding of Internet concepts and possess familiarity on optimizing content online. Often, writers are to provide five to 10 articles in a week with a vast array of topics given by the publisher. A 700-word article usually is equivalent to $3, while a 1500-word article costs $5. In most areas, flexible rates are applied. Some even provide $60 per article, depending on the depth of the topic and the set of requirements. The second online job in Cameroon is a translator. Quite similar to a freelance writer, a translator writes articles with the same content only translated from original articles written in a different language. Many Cameroonians are known to fluently speak and write in second languages asides English and French. Some of the more popular languages are; Chinese, Spanish, German, Japanese and Portuguese. Companies are in favour of applicants who know one or two of these languages. If you’re more proficient as a linguist and know more than three languages that have high demands for translation jobs, you can really earn a decent pay out of this translating job. Where else could one expect to get better translators of English and French if not from a bilingual country like Cameroon? Work-from-home sales representatives are in charge of information and communication technologies services such as registration of domains, hosting and data center services, setting up of corporate email accounts, etc. Earnings are both commission-based and salary-based. To close sales, as a sales rep, you will be expected to perform mass mailing, data mining for leads and cold calling. Numbers and data will either be provided by your company or researched by your own. You will also be responsible for accounts negotiation, online presentation and closing of deals. At the latter part, sales reps take up billing, collection of payment and support tasks. Hence, candidates must possess sales experience in the ICT industry with great technical background. 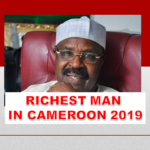 This is one of the most common online jobs in Cameroon though it requires basic training. Don’t worry, Money Master Tutorials is there for you. The job of a virtual assistant spans from research work to support that comes with helpdesk tasks. If you are thinking of working as a virtual assistant, be ready for companies to assess if you are good in speaking and writing in English – being the lingua franca in Cameroon’s English speaking regions. This online job requires a polite tone in answering and making support calls, handling e-mails of customers and other secretarial responsibilities. This administrative role pays up to about $10 per hour. Graphics designing jobs are hot in demand now even much more than it was 2 years ago. If you are skilled in designing graphics such as logos and animations, you can stay at home and earn up to $60 an hour. A vast portfolio of creative designs and Flash works is your ticket to getting hired by companies involved in online work sites. Include web designs and get as much as an additional pay of $50 per hour. If you are capable of taking clear photos, it is highly suggested to include your experience as a photographer in your resume. Companies are generally generous in paying for photographs they can’t get elsewhere to speak for their brand in a unique way. Working as a website designer calls for you to be able to create the look, layout, and features of a website. It is a job that involves a good kmnowledge of graphic design and computer programming. Having a good porfolio of satisfied clients will go a long way in helping you get clients. Client satisfaction is very important as it opens doors to referals from clients you work with. A web designer’s job duties cover all aspects of creating a website. Your duties will include writing and editing content, designing webpage layout, determining technical requirements, updating websites, creating back-up files and resolving code problems as they arise. Website designers and developers enjoy the liberty of charging what they want from clients depends what the clients want. You can develop a website for as little as free to as much as 500,000 or 5 million FCFA depending on who is paying and what is being paid for. I get hire every now and then for such projects. 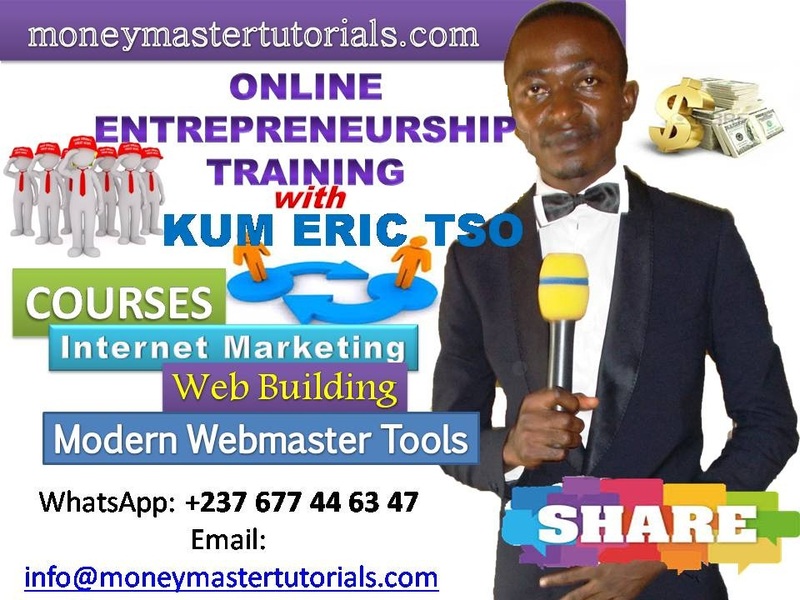 In case, you want to be trained to become a web builder, App developer, or internet marketer, call or WhatsApp us on +237 677 44 63 47 to be part of the Money Master Tutorials Academy. Another option available is to work as an SEO consultant, and this can be a better alternative if you are more technically skilled rather than designing such as taking the graphic designer or web design option. Search engine optimization is the combination of different techniques used to help a website increase its rankings within a search engines results page or “serp” as it is known in the industry. I get paid big money to help businesses and blogs rank high in search engines. You could to if you are trained. Take a look at how I crush the competition for high competitive keywords. Now because of the ever growing number of websites that are published daily, the consequence is the number of people being able to find them decreases. Now although this makes being a search engine optimization consultant a growing and well paid online job in Cameroon, it also requires you to poses a good technical degree of knowledge as well as a broader marketing background. Working in the field of search engine optimization means you’ll be responsible for a company’s websites online rankings. These are based using a range of factors, and will require you to employ a range of tactics both on and off the website. The tactics and strategies used are varied, however, it would be wise to read the search engine’s guidelines and terms of service. Usually your work will involve helping to asses if the website follows best design practices, creating good content and promoting it to the company’s user base to create backlinks. It also requires a small amount of technical ability and skill but also some analytical skill to make proactive marketing decisions that are crucial to the overall ROI of your campaign. Despite the knowledge and work required, being an SEO consultant can be a rewarding job when you are faced with good results, and it does have a steadily growing demand in the jobs market which also makes it pay well for the right job candidate. The sweetest part of the story is that Cameroonian webmasters and companies know very little about SEO. This means being an expert in this field of online jobs in Cameroon brings you into a gold mine. To work from home as a Social Media Analyst in Cameroon, you will need to use your marketing background to improve and build a companies’ online presence and brand awareness through the efficient use of social media networks, blogs and online search engine optimization. Interestingly, it is a growing area of business marketing that requires individuals with strong online communication and business analytical skills. In Cameroon, you can charge between 120,000 to 600,000 FCFA monthly working from home as a social media analyst; depending on the company and what they require of you in terms of expectations. Bear in mind that companies feel more comfortable working with social media analysts who have worked in the same capacity with other brands so you might want to garner some experience in this regard. Did you know that you can make as much as 600,000 FCFA monthly working from home as a Vlogger? Oh yes you can and now is a perfect time to take advantage of the opportunity provided by Youtube to make money from its partner program. 2. Be creative enough to upload quality videos that can generate lots of clicks. 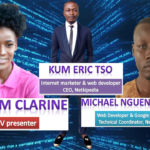 As a beginner, affiliate marketing might initially prove to be a difficult curve to negotiate but with time and some experience, it becomes one of the online jobs in Cameroon you can get done from the comfort of your home. Affiliate marketing is a type of performance-based marketing in which a business rewards one or more affiliates (you) for each visitor or customer brought by the affiliate’s own marketing efforts. Now that we have that out of the way, you should also know that you can make money whenever someone makes a free signup or purchases from the advertiser’s website then he/she gets the commission. A lot of Cameroonian companies are now into affiliate marketing and you can easily find hundreds of affiliate programs where you can register as an affiliate. 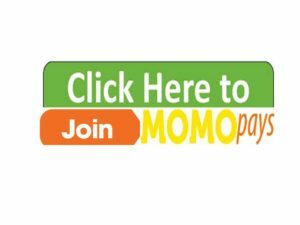 Companies like Momo Pays and a host of others are good programs to latch on to. 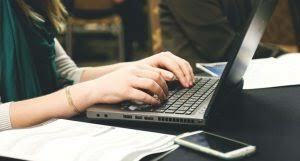 For successful affiliate marketing, you need an internet enabled computer/laptop. Next, you need a good product to market. Picking the right product can be a a tricky business. You need to ascertain that your product has a market and offers real value. When this is taken care of, you need a website, blog or social media page to display your link as well as pre-sell. Another crucial thing you must master is how to market. It is a skill that can be acquired over time. 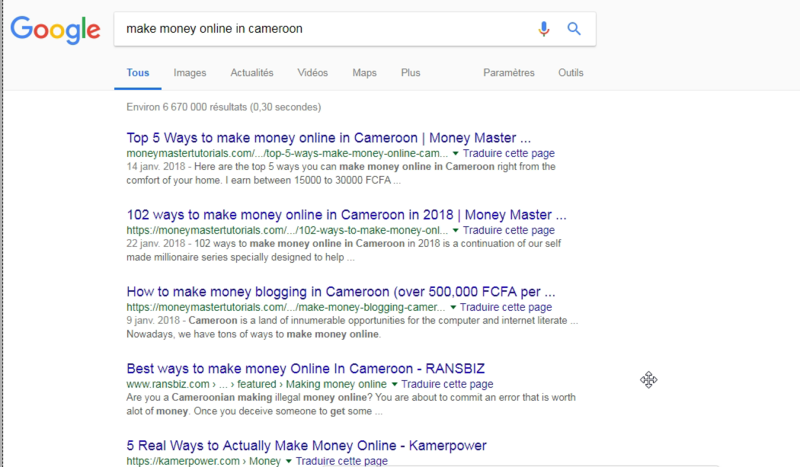 In this indepth guide on making money with your blog you would find how to setup a blog, how to choose a profitable niche, how to generate free traffic to your blog, how to earn 500K monthly blogging in Cameroon and a lot more. Lastly, patience and hard work are two key elements you should not overlook. bear in mind that affiliate marketing is not a get rich quick scheme. 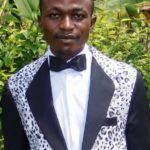 Work from home jobs in Cameroon do not necessarily need you to be computer literate at the start. Companies may offer training and evaluate your performance to match the skills and experiences the jobs require. However, a top requirement for such jobs remains an excellent time management skill. You may also have challenges with availability of resources and you have to do an exhaustive research to avoid fake or ill promised opportunities. But in all, there are great work-from-home jobs with excellent pay and it all boils down to the core skills you possess. What other work from home jobs do you know of? Kindly share your thoughts in the section below.